SBI Long Term Advantage Fund-Series VI helps you to maximize wealth by taking exposure to equities along with the added advantage of tax savings. What is SBI Long Term Advantage Fund (LTAF)? How much does it cost to invest in SBI LTAF? What are the risks involved in SBI LTAF? Who should invest in SBI LTAF? 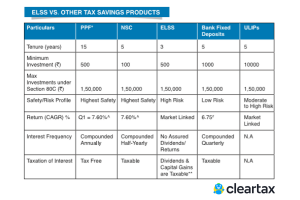 How to Invest in ELSS Funds? 1. What is SBI Long Term Advantage Fund (LTAF)? SBI Mutual Fund house has recently launched a New Fund Offer (NFO) named as SBI Long Term Advantage Fund-Series VI. It is a close ended equity-linked saving scheme which aims at generating capital appreciation over a period of ten years by investing mainly in equity and equity-related securities of companies coupled with tax advantage. It is a diversified equity scheme wherein the fund manager will invest in mix of large-cap/mid-cap/small-cap stocks across market capitalisations. However, the scheme doesn’t assure or guarantee the achievement of investment objective of the fund. The scheme is available as a direct plan as well as a regular plan of the mutual fund. Additionally, both the variants are available in growth and dividend option. In dividend option you get the facility of payout and transfer. The NFO period is from 11th April 2018 and continues till 10th July 2018. 2. How much does it cost to invest in SBI LTAF? The minimum application amount to invest in the scheme has been fixed at Rs. 500 and thereafter, in multiples of Rs.500. Apart from this, the scheme does not charge entry load from the investors. It has a lock-in period of 3 years and the scheme does not levy any exit load if the investor redeems his investments after completion of lock-in period. The scheme considers S&P BSE 500 Index as the benchmark to compare performance of the fund. The fund manager of the scheme is Mr. Anup Upadhyay. The stock picking will be done using top-down, bottom-up and asset allocation approach. 3. What are the risks involved in SBI LTAF? Unlike other open-ended schemes, this fund comes with a lock-in period of 3 years. It means that once you invest your money in the scheme, you won’t be able to redeem the units before expiry of lock-in period. You need to know that prices of bonds as well as equities are affected by a change in overall interest rates. In case of an increase in the interest rates, the prices of bonds would experience a fall and vice versa. Sometimes even the equity gets adversely impacted during a rising interest rate scenario. You may go for a well-diversified portfolio to lower this kind of risk. The Net Asset Value (NAV) of the fund may be affected due to changes in the prices of underlying equities. The stock prices usually fluctuate due to changes in the overall benchmark and other external factors like liquidity flows, business environment dynamics, economic policy etc. The fund manager will maintain a diversified portfolio to take advantage of market risks. Credit risk relates to failure in fulfillment of obligation by the issuer of the fixed income instrument. The fund manager will invest in high-rated commercial papers of the companies which have strong fundamentals, sound background, and robust financial strength. The investment environment may get affected by the changes in the government policy and other political decision. They may create a favourable environment for investment or vice versa. 4. Who should invest in SBI LTAF? The scheme is suitable for investors who wish to have an equity exposure and save taxes at the same time. Being an equity-oriented scheme, the fund manager will invest your money in stocks of companies which have a strong potential to grow in future. So, as the company progresses, your chances of wealth maximisation will also grow with it. Apart from that, you also get the benefit of claiming tax deduction from your taxable income under Section 80C of Income Tax Act. You need to have a long-term horizon of at least 10 year to gain the most out of your investment. However, the scheme will extend a repurchase option which can be availed after completion of lock-in period of 3 years. The scheme is operating for the first time; so it neither has a historical track record nor it spells out top 10 holdings and fund allocation information. You may have to depend on the past performance of the fund manager. At the same time there is no guarantee that the fund strategy works as planned. The fund value will be affected by market risks and other associated risks. You can decide to invest in this accordingly. This scheme is an Equity Linked Saving Scheme (ELSS) which makes you eligible to avail tax benefits. The investments made by you in the scheme will qualify you for a deduction of up to Rs 1.50lac from the Gross Total Income under section 80C of the Income Tax Act, 1961. 6. 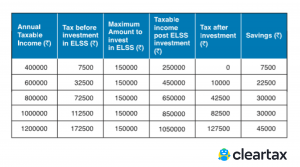 How to Invest in ELSS Funds? 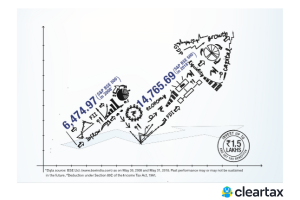 Investing in ELSS Funds is made paperless and hassle-free at ClearTax.